Have you ever wondered why Klown is spelled with a "K"? 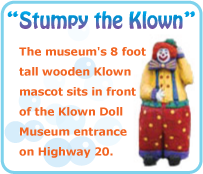 It all started over 50 years ago with the community Klown Band and followed by celebrations using the K so it was most natural to use the K in the museum the same way. After all, they are all in the Klown Kapital of Nebraska! The museum has been featured in a five-page story in the “Living Here” publication at Yankton, S.D., as well as in the “Doll Castle News” magazine, headquartered in New Jersey. It was also featured on Lance’s Journal on Television Stations 10/11 and in Nebraska daily and weekly newspapers. The museum was awarded marketing grants from the Nebraska Division of Tourism on two different years and has received additional marketing support from the Pierce County Visitors’ Bureau. 2006: Outstanding Attraction by the Northeast Nebraska Travel Council. less by the Nebraska Division of Travel and Tourism. other attractions in a three-county area, given by the Northeast Nebraska Travel Council. 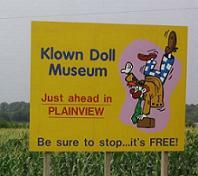 The Plainview Klown Doll Museum is operated through a joint venture of the City of Plainview, the Chamber of Commerce, and numerous volunteers. 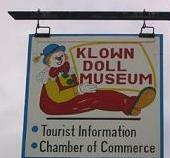 The City owns the building and the dolls and the City, in turn, asks the Chamber of Commerce to operate the museum. That is done by a committee of two members from the Chamber and one member of the community at large. The Chamber contributes operating funds annually to the museum and community volunteers staff the museum. Current committee members for the Plainview Chamber of Commerce are: Lee Warneke, Julie Newman and Larry Bonge.